Blueberries occur in their wild form on moorlands and heath in the northern hemisphere and are known by a variety of local names, bilberry, whins or wimberry. They are member of the Ericaceae family and related to heaths and heathers. They are difficult to cultivate and their purple fleshed fruit has a stronger flavour than garden and commercial varieties. Growth habit and preferred conditions make many species and hybrids an interesting fruit for small gardens and those in colder climates. 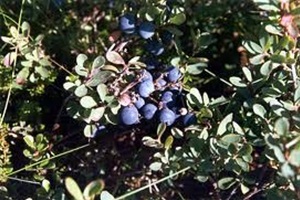 Highbush blueberries (Vaccinium corymbosum and Vaccinium australe)are forms derived from the American wild blueberry. They produce clusters of grey bloomed, deep purple fruit rather larger than the wild types, their flesh is green. They need a cool, moist climate with at least 800 hours below 7oC and an acid soil. 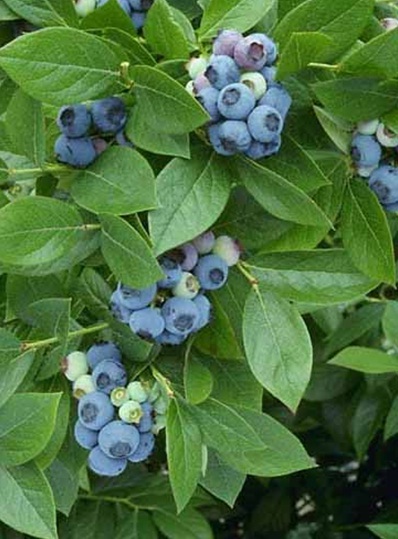 Highbush blueberries are deciduous, bearing gold and red leaves, grow to a height of 2m, with white flowers in spring and grow best where winters are cold. Rabbit-eye blueberries (Vaccinium ashei) get their name from their pink, unripe berries and are grown in the same way as the highbush varieties. They need less chilling hours, about 350-600, and are better suited to warmer regions. A third group are the tetraploid hybrids, produced from crosses of the previous two and wild species, have an even lower chilling requirement of 250-400 hours. These can be grown in mild, coastal areas. All groups need a growing season with at least 160 frost free days and two months of summer with mean temperatures greater than 200C. Cropping will be light at first yields will improve over three years. Rabbit-eye blueberries need a compatible pollinator, the others are self fertile. Blueberries prefer a sunny site, well drained acid soil high in organic matter. A high pH can be adjusted with acidic compost or adding sulphur. 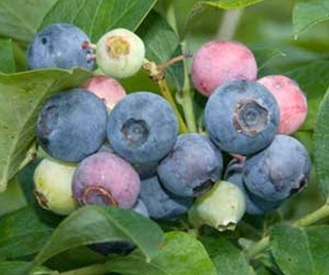 Blueberries can be grown in tubs and pots filled a suitable mix. Plant in early spring, space 1.5 metres apart. They can be propagated in the same way as other ericas, from cuttings or by natural layering.